Edit: I've been working on my Hero character, trying to a more stylistic / childlike approach. The cartoon will obviously be aimed at children, so I've made him slightly younger, and it also allowed his naiveity to come across better. 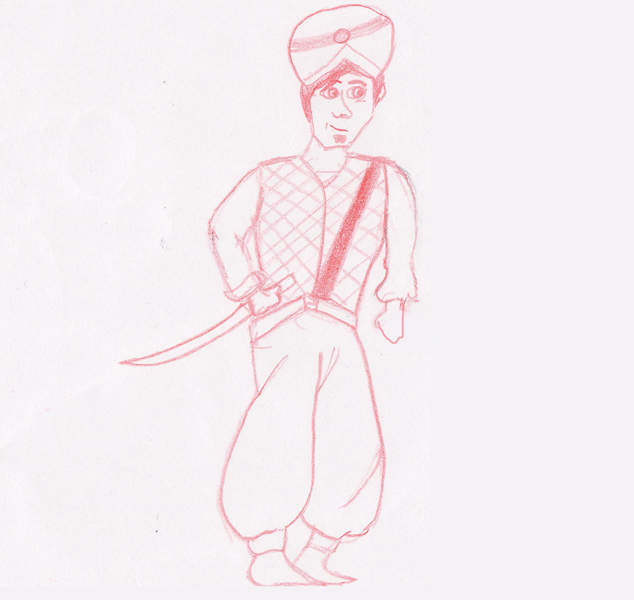 I need to work on his hands, head-gear and shoes more. 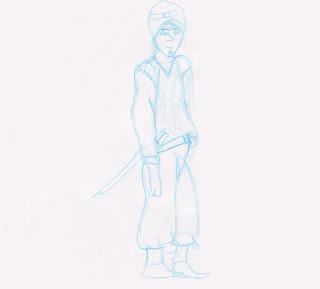 I also need to do some detailed work into his clothing and weapon. This week I have a lot of character design work to do as I'm really behind with the project, I've done bits of work on it here and there, but I still have a lot of designs and refining to do before I begin to create my Character Bible. I'm going to use this post to add the most up-to-date ideas as well as working out the synopsis and character profiles / backgrounds. 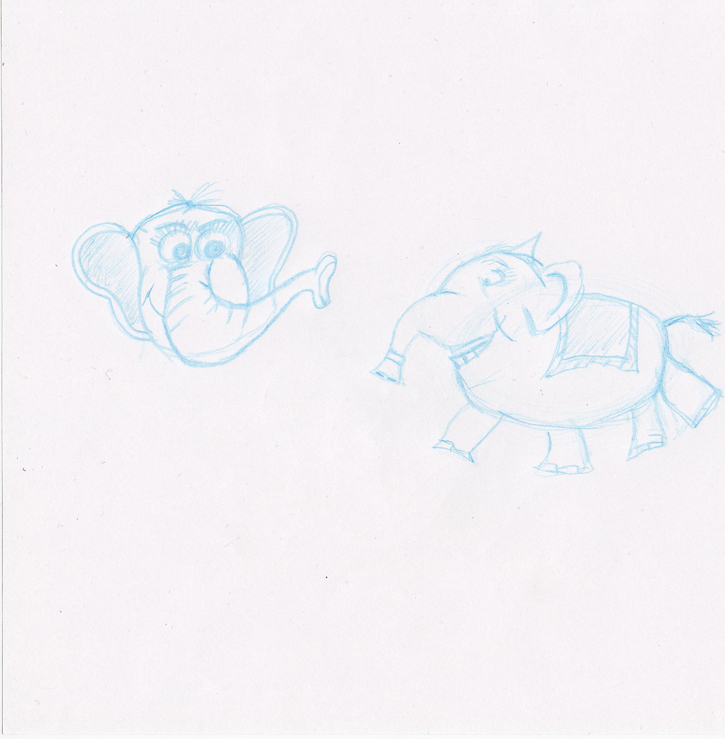 Below are my draft sketches, I'm working towards my final turnarounds, the below images are what I have so far. The Kingdom of Saba is a peaceful land. Sitting in the Persian desert, it is ruled by ageing King Namir who treats his people well. However, Emir Bloodaxe, leader of a band of gold-hunting desert Vikings has discovered the kingdom and is planning to plunder it of all treasure, leaving the land in ruin. 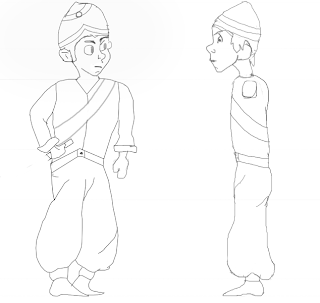 Namir is too old to protect his lands, leaving his Son, Prince Pedrum to finally prove himself and protect Saba's people. Alongside Pedrum is his trusted companion, a pet elephant from the Royal Palace, Ruby. The prince must outwit Emir Bloodaxe's evil schemes and cut-throat followers to protect his father's throne. 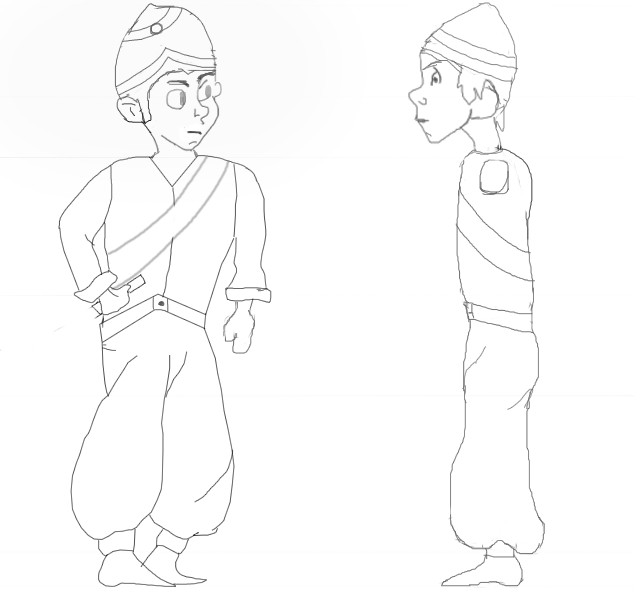 Heir to the throne of Saba, his father is ageing and is unable to leave the palace. 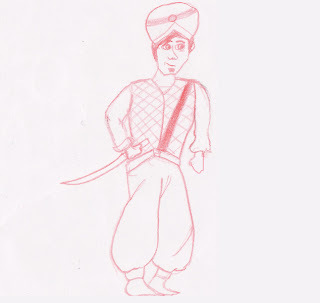 Although only a late teenager, Pedrum has the role of protecting the land from invaders. 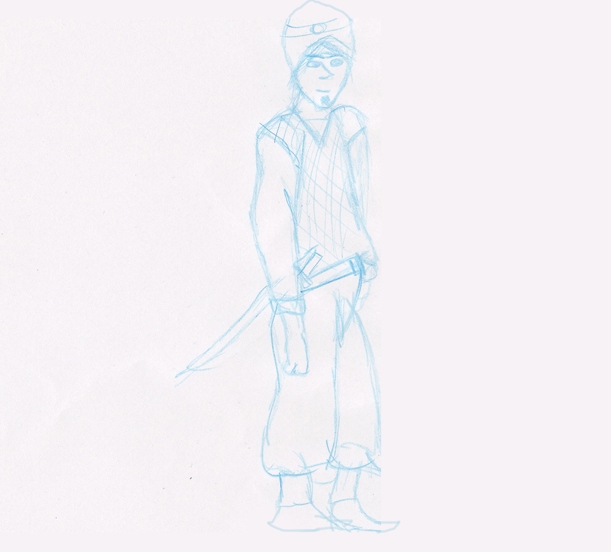 When younger, Pedrum was taught to be agile as well as to fight, he is energetic, skilled but also naive. Pedrum wears chainmail vest to show his Royal status, but also wears common clothes beneath. He has an Arabic Sabre on his belt, ready at all times. 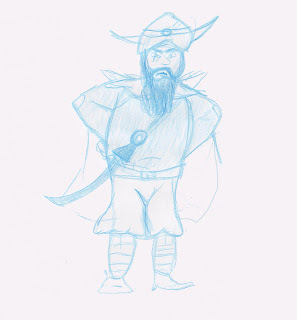 Pedrum never kills, but he uses his sword to cut ropes, block passages and occasionally throws it. Hero's sidekick is Ruby, a female elephant who the hero rides, similar to a horse. She can not speak can understand commands and the hero's speech. She is very loyal as well as clever and brave, Ruby is only a young elephant, adopted by the Royal Palace as a pet. When Emir Bloodaxe hatches his plans, the hero chooses Ruby as his sidekick to help save the kingdom. Ruby wears a cloth saddle so that the hero can ride her, She has a gold earring to show she is a royal pet and when needed, she wears a viking-styled metal helmet for protection. She is fast for an elephant, not only does she gallop with the hero on her back but can use her trunk to perform tasks and help defeat the villain. 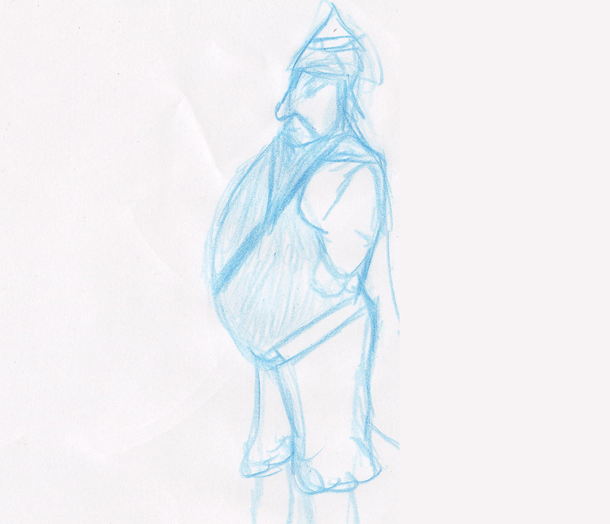 Emir Bloodaxe (Based on ancient Norse and Arabic names) is the leader of a viking band looking for a kingdom to rob and occupy. The Kingdom of Saba is a perfect target, as it's king is old, which leads Emir to attack. Emir has a band of evil followers, following him for gold and to plunder riches. He has a large axe which makes him threatening and a scarred face from past battles. He wears gold bands on his wrists to show off his wealth. Emir Bloodaxe usually gets his own way, stealing from the weak, however this time he is matched with Prince Pedrum, the kings heir, who out-smarts him at every opportunity, leaving him humiliated.